Speed 30 ft., climb 30 ft., fly 60 ft. Bite. Melee Weapon Attack: +4 to hit, reach 5 ft., one target. Hit: 7 (1d10 + 2) piercing damage. Acid Breath. The dragon exhales acid in an 20-foot line that is 5 feet wide. Each creature in that line must make a DC 11 Dexterity saving throw, taking 18 (4d8) acid damage on a failed save, or half as much damage on a successful one. Slowing Breath. The dragon exhales gas in a 15-foot cone. Each creature in that area must succeed on a DC 11 Constitution saving throw. On a failed save, the creature can't use reactions, its speed is halved, and it can't make more than one attack on its turn. In addition, the creature can use either an action or a bonus action on its turn, but not both. These effects last for 1 minute. The creature can repeat the saving throw at the end of each of its turns, ending the effect on itself with a successful save. 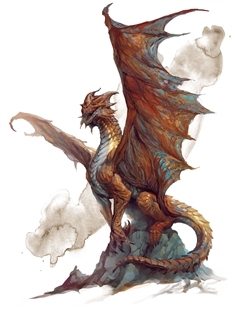 The dragon chooses a 10-foot-square area on the ground that it can see within 120 feet of it. The ground in that area turns into 3-foot-deep mud. Each creature on the ground in that area when the mud appears must succeed on a DC 15 Dexterity saving throw or sink into the mud and become restrained. A creature can take an action to attempt a DC 15 Strength check, freeing itself or another creature within its reach and ending the restrainedcondition on a success. Moving 1 foot in the mud costs 2 feet of movement. On initiative count 20 on the next round, the mud hardens, and the Strength DC to work free increases to 20.